During the aging process, the retention of muscle strength, and perhaps also the building of muscle strength, becomes easier as you consume more tomatoes and more tomato products such as tomato juice and paste. A remarkable study, that Japanese researchers published in the Journal of Epidemiology, suggests this. If people do not do physical work and do not exercise, they lose a little muscle and muscle strength every year after their thirtieth year. Could the consumption of tomatoes, tomato juice and other tomato products slow down this loss of muscle strength? Japanese epidemiologists, associated with Tohoku University, tried to answer that question. The researchers determined with how much force 259 Japanese adults aged 22-68 could pinch a gripper with their hands. In addition, they determined the dietary pattern of the study participants. Three years later, the researchers measured the muscle strength of the study participants again. When the researchers brush away the effects of as many other factors as possible with statistical tricks, tomatoes and tomato products still protected against the decline of in muscle strength. The effect does not seem big, but the researchers followed the study participants for only 3 years. How big would the effect be if the researchers followed their participants for 20 years? The Japanese also looked to see if other food groups, such as citrus fruits, carrots, onions and cabbage vegetables, protected muscle strength as the years went by. They found no significant effects. The intake of fruit and vegetables in general didn't protect against the decrease of muscle strength either. "This study found that increased frequency of consumption of tomato and tomato product was associated with reduced decline in handgrip strength among Japanese adults, even after consideration of potential confounders", the researchers summarize. 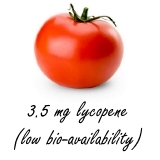 "Therefore, this study suggests that consumption of tomato and tomato product may be protective against the decline in skeletal muscle strength associated with aging." Without changing your diet and without doing more exercise. Exercise is healthy - no discussion there - but intensive physical exercise increases the production of aggressive molecules that can damage our genetic material. Two glasses daily of tomato juice can help middle-aged women have fewer menopausal symptoms, feel better about themselves, and keep their weight steady.